Gladewater is a city in Gregg and Upshur counties in the U.S. state of Texas. The population was 6,441 at the 2010 census. U.S. Route 80 traverses the city. "Treasuring the past, while embracing the future"
Oil derrick replica in downtown Gladewater recalls the oil boom years. First Baptist Church of Gladewater located on U.S. Highway 80. 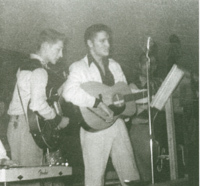 The town is probably most famous as a base during Elvis Presley's early career, and also as the town in which Johnny Cash wrote "I Walk the Line". In the early 20th century, Gladewater was an oil boom town. Gladewater is known as the "Antique Capital of East Texas" with its Main Street downtown antique district. It is located in western Gregg County and southern Upshur County at 32°32′34″N 94°56′49″W﻿ / ﻿32.54278°N 94.94694°W﻿ / 32.54278; -94.94694 (32.542666, -94.946950), primarily within Gregg County. U.S. Route 80 leads east 12 miles (19 km) to Longview and west 10 miles (16 km) to Big Sandy. U.S. Route 271 crosses US 80 in the center of Gladewater, leading north 14 miles (23 km) to Gilmer and southwest 25 miles (40 km) to Tyler. According to the United States Census Bureau, Gladewater has a total area of 12.2 square miles (31.5 km2), of which 11.6 square miles (30.0 km2) are land and 0.54 square miles (1.4 km2), or 4.61%, are water. The Sabine River forms the southwest border of the city. Gladewater was founded by the Texas and Pacific Railway Company in 1873 on land bought from Jarrett Dean and Anderson White. A community called St. Clair, 2 miles (3 km) to the east, moved to Gladewater when the railroad announced that the only mail stop in the area would be there; residents from Point Pleasant, also bypassed by the railroad, moved to Gladewater. The first post office at Gladewater was established on August 22, 1873. The town's name probably originated from its proximity to Glade Creek, a tributary of the Sabine River that rose in a rather barren region called the Glades. On April 7, 1931, the first Gladewater oil well blew in. It was located one mile (1.6 km) outside town in the Sabine River bottom. Oil production led to a population increase during the 1930s from about 500 to around 8,000 people. In 1940, after the oil boom, Gladewater had a population of 4,454. Civic improvements in the 1940s included an extensive paving project and a commercial airfield. Between 1940 and 1960 the population grew to 5,742. Lake Gladewater, constructed on Glade Creek in 1954, provides recreation for city residents. During the 1970s Gladewater moved from an oil-oriented to a more diversified economy, primarily because of depletion of oil resources in the area. The movement of salt water into the western edge of the large East Texas Oil Field affected Gladewater first. By 1980 the town had a total of 6,548 residents, 4,311 in Gregg County and 2,237 in Upshur County. The economy in the 1980s depended on the oil industry and related activities and on the manufacture of such products as furniture, clothing, paper products, and boats. The lumber industry is also important, as is agriculture. By 1990 the community had become well known for its numerous antique stores. Important annual festivals include the East Texas Gusher Days in April, the Gladewater Roundup Rodeo in June, the Arts and Crafts Festival in September, and Christmas in November. Gladewater is seen as an important antiques hub and has earned the slogan "Antique Capital of East Texas". In 1935, the Boston Red Sox franchise had a minor league baseball team in Gladewater, the Gladewater Bears. The minor league stadium has since been turned into a city park. The predominant features of the stadium are long gone, but the stadium is located near the Lee Building in Gladewater. As of the census of 2000, there were 6,078 people, 2,257 households, and 1,593 families residing in the city. The population density was 523.7 people per square mile (202.1/km²). There were 2,601 housing units at an average density of 224.1 per square mile (86.5/km²). The racial makeup of the city was 79.80% White, 16.12% African American, 0.82% Native American, 0.58% Asian, 0.02% Pacific Islander, 1.58% from other races, and 1.09% from two or more races. Hispanic or Latino of any race were 3.50% of the population. There were 2,257 households out of which 31.5% had children under the age of 18 living with them, 51.6% were married couples living together, 15.4% had a female householder with no husband present, and 29.4% were non-families. 26.1% of all households were made up of individuals and 12.6% had someone living alone who was 65 years of age or older. The average household size was 2.55 and the average family size was 3.06. In the city, the population was spread out with 27.3% under the age of 18, 8.9% from 18 to 24, 25.1% from 25 to 44, 22.2% from 45 to 64, and 16.4% who were 65 years of age or older. The median age was 37 years. For every 100 females, there were 85.5 males. For every 100 females age 18 and over, there were 80.8 males. The median income for a household in the city was $28,118, and the median income for a family was $32,278. Males had a median income of $24,770 versus $23,271 for females. The per capita income for the city was $14,317. About 15.5% of families and 19.6% of the population were below the poverty line, including 24.9% of those under age 18 and 20.9% of those age 65 or over. The city is served by the Gladewater Independent School District, home of the Gladewater Bears. Gladewater is featured in the Michelle Shocked song "(Making the Run to) Gladewater" on her album Short Sharp Shocked. The Gladewater Highway is referenced in the Wayne Hancock song "Juke Joint Jumping". Gladewater Highway is also referenced in the Adam Carroll song "Race Car Joe." The climate in this area is characterized by hot, humid summers and generally mild to cool winters. According to the Köppen Climate Classification system, Gladewater has a humid subtropical climate, abbreviated "Cfa" on climate maps. ^ "City of Gladewater". City of Gladewater. Retrieved March 23, 2017. ^ a b "Geographic Identifiers: 2010 Demographic Profile Data (G001): Gladewater city, Texas". American Factfinder. U.S. Census Bureau. Retrieved March 23, 2017. ^ "Skip Butler". databaseFootball.com. Archived from the original on May 31, 2012. Retrieved December 10, 2012. ^ "Winston Hill". databaseFootball.com. Archived from the original on October 20, 2012. Retrieved December 10, 2012. ^ "Chris Johnson #39 DB". NFL Enterprises, LLC. Retrieved December 10, 2012. ^ "Monty Montgomery". databaseFootball.com. Archived from the original on October 23, 2012. Retrieved December 10, 2012. ^ "James Scott". databaseFootball.com. Archived from the original on October 15, 2012. Retrieved December 10, 2012. ^ E., CHRISTIAN, GEORGE (2010-06-15). "SHEPPERD, JOHN BEN". tshaonline.org. Retrieved 2017-05-07. Wikivoyage has a travel guide for Gladewater.